Thank you Ben Naga bennaga.wordpress.com for the Genuine Blogger Award. I do actually try to be genuine even if I have flaws and lack knowledge. I am going to pass this award onward to Oosterman Treats Blog oosterman.wordpress.com. He is a very good writer and creates his blog from Australia. Acceptance of this award asks the recipient to list seven random and weird facts about himself or herself, but I figure I expose enough via this recent little biographical project and therefore believe I have fulfilled this request. The other aspect or in my opinion the most important piece is to pass this award on to a few other bloggers in which the recipient enjoys reading. I already list the sites I enjoy visiting or discussing issues with below the tag cloud, but I will pick a few for various reasons discussed below. There are several sites I don’t pick because I know they already received the award. These are in no particular order. The links to these sites are under the tag cloud. Slices of My Soul. I recently connected with this person and I was shocked to learn of her young age relative to the power and clarity of her poetry. The writing is very honest and clear. I think the name of her site speaks for itself and I wish her many victories in the battles to come. To A Dusty Shelf We Aspire. I originally clicked on her site because of her beautiful picture, but then I realized I was dealing with a very intelligent being. She obviously has a passion for reading and frequently posts passages from an expansive array of literature to convey her thoughts (that is my take anyway). On occasion she will write her own poetry or short stories or commentary which is a real treat. I anticipate she will publish many works in the future if she hasn’t done so already. Summer’s Portfolio. Summer is a young artist and math major. Her posts are extremely versatile to the point where we approach random numbers. I enjoy her artwork and pictures of the food she cooks as well as her short philosophical pieces that often include math theory that I may or may not comprehend. Art Rat Café. A former art teacher and artist. He displays his art and also combines images and words to create meaning. He has followed the true path and is climbing into the mountain peaks. He is headed to Mexico for an extended period to create art. Where Pleasant Fountains Lie. A poet that is direct and honest. She is loaded with intelligence and her poetry stirs the imagination. Like Penn, I originally went to her site because of the beautiful picture and again found extreme content. Rare that both beauty and intelligence are aligned. She recently came up with an idea for bloggers to send each other their poems in handwritten form. When I received hers it brought a human touch to this on-line medium of communication. Alternative Poet. I will let a piece of her “About” section highlight what attracts me to her site. “This site centres on a modern approach to poetry writing. Are you tired of reading poetry you have to dissect to decipher its meaning? If like me, you like to read poetry that is unambiguous in its language and style then this is the site for you. It is not about poetic license or being correct in the literary sense, it is about expressing feelings and thoughts on everyday events in life through the instrument of rhyme and imagery. Brad Allen Saunders. A very intelligent man and author of a book. I plan on purchasing a copy. He doesn’t post that often, but when he does it is loaded with content. Resources and Environment. A young person obtaining her Masters in Environmental Management. I enjoy her posts on the problems we face in preserving our environment. Any person focusing on this problem is dear to my heart. 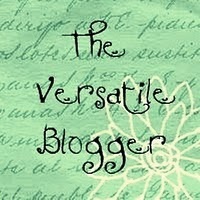 All folks listed above please confirm acceptance of the Versatile Blogger Award on this page in the comments section. If I don’t hear from you in a few days then I will go to your site to let you know you won the award. If you accept then you can follow the purpose of the award which I outlined above. Congratulations!! !